Tridon Australia Pty Ltd is an Australian owned company and supplies an extensive range of the highest quality products to the Automotive, Original Equipment, Industrial and Hardware markets in Australia and New Zealand. Quality and customer service are of the utmost importance and Tridon's manufacturing and distribution facilities are all ISO9002/QS9000 quality accredited and ISO14001 environmentally accredited. COMPLETE RANGE NOW AVAILABLE TO ORDER ON-LINE! Tridon Australia was incorporated in 1976 and specialises in the distribution of products to the industrial, automotive, hardware and export markets. It is a 100% Australian owned and managed company. Tridon Australia manufactures premium quality hose clamps and distributes an extensive range of products including Wiper Blades & Refills, Thermostats, Radiator, Petrol & Oil Caps, Battery Terminals & Cables, Flashers & Relays, Ignition Modules & Coils, Switches & Sensors, and Cable Ties. Hose Clamps Tridon's extensive clamp range includes perforated and solid band clamps, T-Bolt clamps, EFI clamps, double ear clamps, rubber lined clamps, spring lock clamps, uniband clamps, vinyl coated clamps and specialised clamping solutions for complex sealing or fastening requirements. Wiper Blades and Refills Includes plastic and metal wiper refills and complete wiper blades, with a range of attractive merchandisers for retail display. Cooling System Tridon offers an extensive range of thermostats, gaskets and radiator caps for your cooling system. 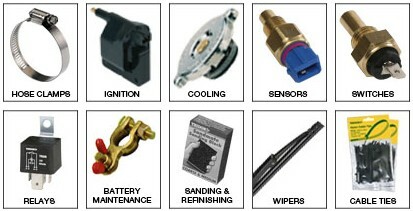 Ignition Includes a range of ignition modules and coils, pick up coils and crank angle sensors. Switches and Sensors Includes an extensive range of oil pressure, water temperature, coolant temperature, thermo fan, stop light and reverse light switches and sensors. Flashers and Relays A comprehensive range of flashers and relays to suit turn signal applications and general applications including fuel pump, drive lights, fog lights, head lamps, door locks, horn, ignition, instrument panels and park lamps. Battery Terminals and Cables Precision cast, solid brass battery terminals and battery cables. Cable Ties Tridon offers and comprehensive range of black, natural and coloured cable ties to suit many applications. LOOK UP THE TRIDON PART NUMBERS YOU REQUIRE. USING THE CATALOGUE BELOW THEN ORDER ON-LINE WITH THE BELOW LINK! How do I order my Tridon Products? Step 1: Simply look up the Tridon part numbers you require using the Tridon Catalogue. CLICK ME TO ACCESS THE ON-LINE CATALOGUE! at our on-line shop to locate and order your Tridon Products quickly and easily! Contact Noel's Auto Parts for all your Quality Tridon Products!